Jordan Brand made noise this year after releasing two impressive editions of the Air Jordan 1 Phat Low. This Holiday Season, they are expected to generate buzz once again with the release of a new edition of the silhouette. 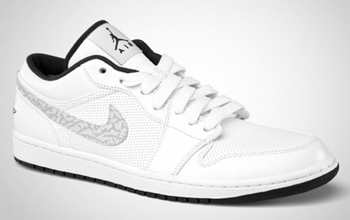 The Air Jordan 1 Phat Low, which is a variant of the shoe that started it all, will be released in White/Anthracite colourway, which looks simple but is definitely impressive. The shoe features a white perforated make-up plus anthracite accents that sits on a black outsole. Grab one because you will definitely get your money’s worth! “Velvet Brown” Air Jordan 1 Phat Low Coming Out!